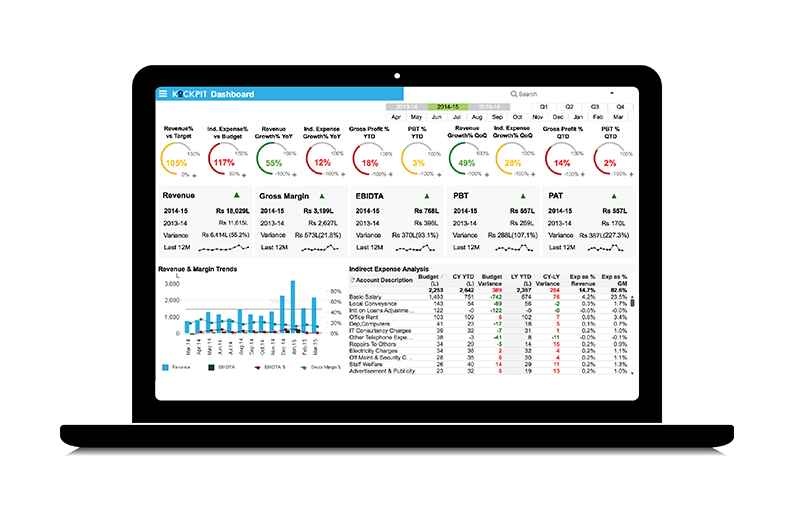 Kockpit is a cloud-based pre-configured Business Intelligence solution. Kockpit is imperative for companies with turnovers in the range of Rs 50-500 Crore. Products offered by Team Kockpit Analytics are on Cloud, reducing the need for infrastructure investment, services and upfront licensing cost. After capturing NCR Markets, the company has the plan to expand its markets soon to Western parts of the country, Europe and the Japanese markets. Kockpit covers every need related to Business Analytics anywhere anytime. It provides you business insights at a single place giving the holistic picture of the business. Since this applies analytics on the ERP data, it highlights and distinguishes the parameters which need urgent/ important attention. It is a decision support system which helps CXO’s identifies red flags, for immediate action/remediation. It gives owners a complete self reliance with visibility on all parameters of business.